Last year, I predicted that Michigan basketball was going to be truly abysmal. With the loss of DeShawn Sim and the overrated Manny Harris, Michgan was losing most of its scoring, a lot of its depth, and with it, any hope for the future. I thought this season was going to be when the other shoe finally dropped and people realized that this basketball program was headed nowhere fast. Fast forward to today, and Michigan has nearly completed its non-conference schedule and is sitting comfortably at 9-2 with a close loss to #10 Syracuse and an embarrassing flop to UTEP. Regardless, this is not the basketball team I expected to see. There are a couple of reasons for this, most prominent of which is the evolution of Darius Morris. I assume Morris' start against Wisconsin is the beginning of the Morris era and we rarely see him start games on the bench for the rest of his time at Michigan. A lot has been made of the fact that he can't really shoot from the outside, to which I say, bullpuckey. I don't want Morris shooting threes anyway. I want him to be a point guard, something that he's increasingly proving he might actually be. I'm exceedingly pessimistic about the 2011 season but that might change as Morris gets more and more playing time and we get to see just how well he can run the offense. Next year, when Morris gets a little more confidence and playing time, I think we see him become arguably the most effective and important player on the team. And he's going to have to be, what with the harrowing lack of depth in Michigan's frontcourt. The point being, Morris is a significant upgrade over Harris because of his ability to see the floor, his desire to play within the system, and his unselfish play. Michigan's defense is now Wisconsin's: built on never fouling you, never blocking your shots, never stealing the ball, but forcing you into a wide array of not-very-good shots. Michigan is 10th in three point D, 57th in two point D, 11th in FTA/FGA, 14th in eFG%, and well down the list when it comes to forcing turnovers and getting blocks. Instead of leaving their feet they get in spots to take charges and get their hands in the air. Michigan's defense has been smothering teams all year. If they keep this up, it won't matter that they can't shoot from three. ...we can likely say--albeit not definitively--that the 29.7% three-point shooting performance the team has shown this year is within the team's reasonable capabilities. That is, we can say that the performance this year is quite likely representative of the team's skill and performance given their outcomes last year. And it's clear at this point that Michigan's shooting woes were not an isolated event. Frankly, the guys who are supposed to be good at shooting threes simply aren't. Of the players that have played significant minutes, only Stu Douglass is shooing threes over a 40% clip. And only two (Matt Vogrich and Evan Smotrycz) are shooting above 30%. Simply put, this team isn't very good at shooting threes. The rest of the team's success can be attributed to role players Zack Novak and Douglass playing their natural positions and performing to expectations, and some of the younger players stepping up in big moments. Tim Hardaway Jr. is in the process of solidifying himself as a star on this team, averaging 11 PPG and 3.5 RPG. Jordan Morgan is averaging 10 PPG and 7 RPG--despite being an awful, slow post defender. And Smotrycz has shown flashes of brilliance early on even though he's physically unimposing and being forced into early playing time. Before the season, I thought Michigan was headed toward the cellar of the Big Ten, below up-and-comers Indiana and the other recent basement dwellers. But with the emergence of Morris and Michigan's unflappable defense, this team could turn into something legitimate. 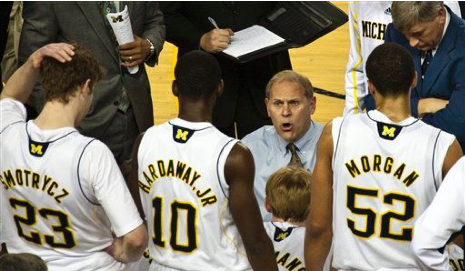 More importantly, the future once against looks bright for Beilein's squad. Whereas at the end of last year, Michigan looked to be digging themselves a hole they wouldn't soon come out of, now Michigan appears to be a young start up, capable of running with any team in the country on a given night. Other: I'll be keeping a running tab of all the players' stats this year, much like the football ones on the right sidebar. Right now I just have per-game averages, but I might start to include total as well. Let me know if you want to see anything else on there. Here. Fnally saw Moris go up against some good competition and it wasn't pretty at all. Barlow and Moore really bothered him and Morris resorted to 1on1 stuff instead of being patient. However, Purdue's extended defense did such a nice job there wasn't much room to operate. Morgan played like a manchild though. I wasn't able to watch the whole game, sadly, so I can't make a real fair judgment about how he played. His numbers weren't too bad aside from the 3-14 shooting, but those doesn't necessarily tell the whole story. I'll keep an eye on his performance against more difficult competition in the future.